Sadly, of course, I can’t know what he thinks. He’s been gone for over 40 years. But I have something that’s almost as good — a special book with an inscription that always makes me smile. 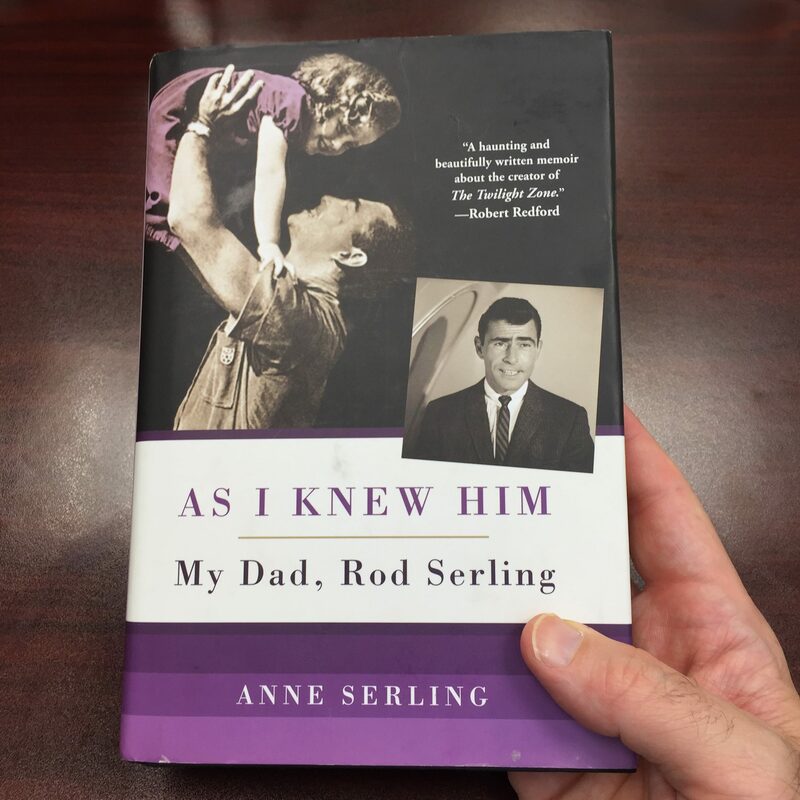 It’s “As I Knew Him: My Dad, Rod Serling”, by Anne Serling, the younger of his two daughters. Her book was published in 2013, and I always recommend it to anyone who wants to know more about her famous father. I’ve had the opportunity to correspond a bit with Anne, who’s a very nice lady. A talented one, too: her book is not only a heartfelt tribute, but a compulsively readable one. It’s written in a very personal, inviting style — nothing like the semi-clinical tone one normally gets with biographies. It’s a search, really, for a father she lost when she was only 20 years old. Thanks, Anne. It’s a real pleasure — especially when I hear that from someone who knew Rod Serling so well. As your dad might say, file this under “M” … for “moving”. This post is part of the Cherished Blogfest being hosted by Dan Antion, Damyanti Biswas, Peter Nena, Cheryl Pennington, Mary Giese, Sharukh Bamboat. You can find all the participants at this link or via Twitter with the hashtag #CBF16 or #CherishedBlogfest. 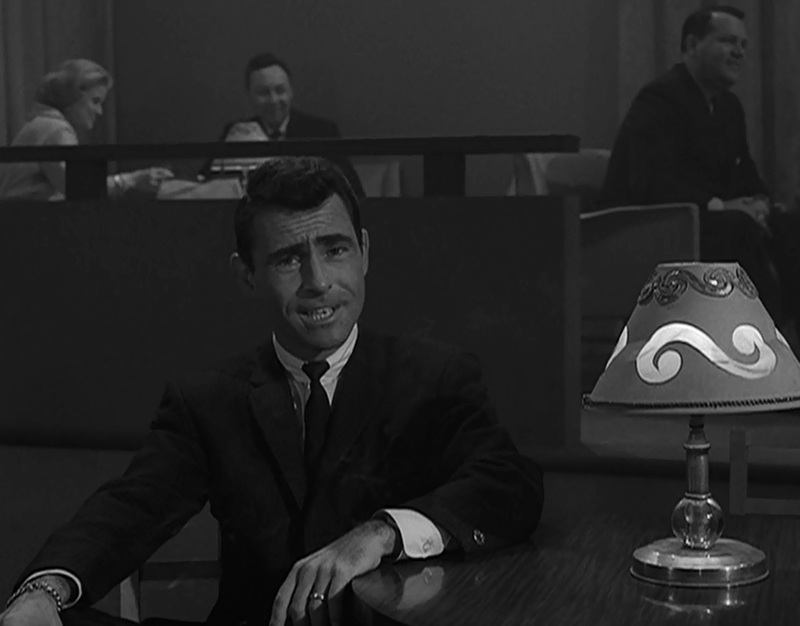 For a daily dose of Serling, you can follow me on Twitter, Facebook or Pinterest. You can also get email notifications of future posts by entering your address under “Follow S&S Via Email” on the upper left-hand side of this post. WordPress members can also hit “follow” at the top or bottom of this page. Posted on 07/29/2016, in Rod Serling and tagged Anne Serling, Cherished Blogfest, Rod Serling. Bookmark the permalink. 50 Comments. This is a really nice, unique response to the challenge. A book signed by its author is always special; however, when you make a personal connection with the author, special becomes “cherished.” I’m so glad that you were able to share your story during this blogfest. Thank you! It was a pleasure, Mary. Thanks for stopping by! So interesting.. I do remember “Twilight Zone” and the serious handsome man who introduced the stories. He’s hard to forget, I’ve found. Glad you liked the post! It really is nice — I’m grateful. Thanks for the reminder. Thank you for visiting my blog. You had me at “Rod Serling” because I work in Binghamton, New York and exercise walk in Rod’s old neighborhood on the West Side from time to time. And pass the junior high school he went to, the park he played in, and one of his childhood homes on Bennett Avenue. Well, I envy you! I’ve yet to even visit there, unfortunately. You can expect one heck of a blog post when I do. Thanks for stopping by. What an incredible cherished object, Paul. You are so right in your description of the book. That is one of my favorite books. I received it for Father’s Day and I think I finished it in 2 days. I could not put it down. I love that he had Irish Setters, I feel like it’s one clear thing we have in common. As for social media, I “met” you in the run up to a Marathon (introduced by @ComplexWays) and I’ve been a regular at your blog ever since. And, from you, I connected to Wendy. I think RS would realize how those connections are worthy of acknowledgement. That’s a very good point, Dan. I wasn’t even considering the social side of social media when I wrote that, but you’re right, it helps us make personal connections. Since the theme of loneliness ran through so much of TZ, I imagine RS would approve, yes. Very glad to have you here and to be a regular on your blog as well. As for the object, ha, I was about to do an object in a TZ when I thought of the book, and it just seemed right. Glad you liked the post — this was fun! Well, Paul. There are so many objects in the episodes, we can have these for years to come. Thanks again for joining us. So cool! Haven’t read the book, but I can’t imagine a Serling fan like you could be paid a better compliment. Nice! I certainly couldn’t. It’s a real treasure. Thanks! An author signed copy and that too a book about the person you admire… wow! !… that’s incredibly precious and cherished book indeed! Thanks! You can see why I have a separate copy for reading purposes. Paul, seems like we both blogged about a legacy. Small wonder that you appreciate that inscription. Indeed. Just words on a page, but what a special meaning they take on. Glad you stopped by, Simon. A book as the most cherished object in the world is always awesome. Thank you for participating in the Cherished Blogfest 2016. Thanks, Peter. Being such a bibliophile, I was glad when the idea to feature a book occurred to me — especially this one. I appreciate your stopping by! What a great way to put forward your story. A really nice post to say what’s close to your heart. As a co-host, I thank you for being the part of the Cherished Blogfest and I hope you’re having a great time meeting new and existing blog friends. It’s been a pleasure. It was a good experience to do a more personal post — most of mine are a bit more academic in nature. Thanks for the nice comment! I can envision that book taking pride of place on your bookshelf! How very special indeed!! It certainly does — front and center! Glad you enjoyed the post. 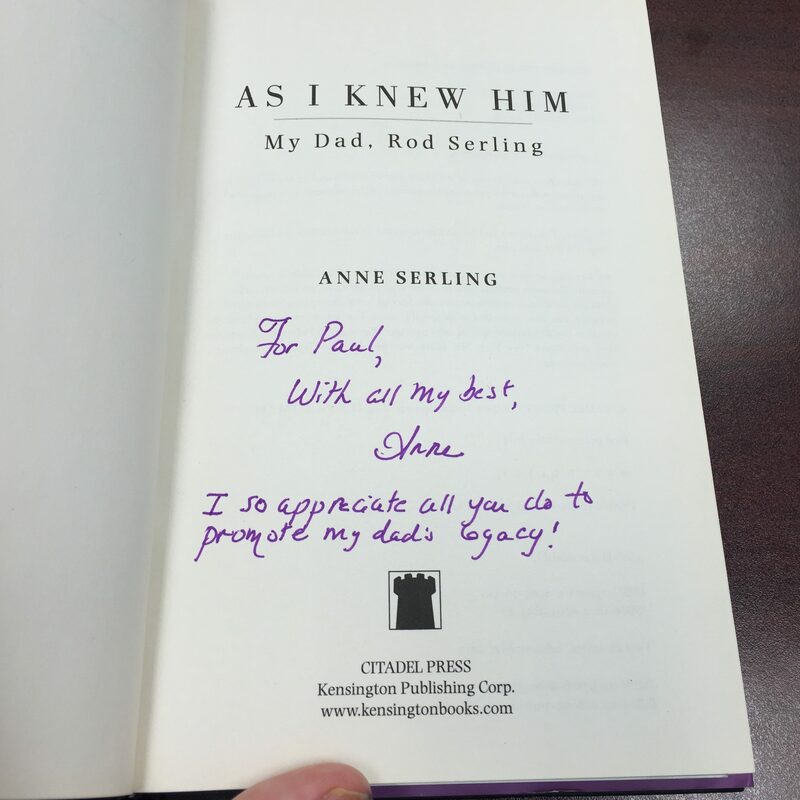 Not only did I enjoy the story behind the inscription, but you taught me that it is Serling, not Sterling…. Thank you for participating in our blogfest, from one of your co-hosts. Ah, good to know! A common misperception, btw. And thanks, it’s been an enjoyable experience. Nice. It gave me chills. And great minds think alike…since we both used inscriptions for this blog fest. Yes, and so far, I haven’t seen many others at all (if any), so we can enjoy being a bit unique. Glad you enjoyed the post, Sharon. You can imagine how I felt when I first read the inscription. What a thrill that must have been, when you first read the inscription! How wonderful to have your work acknowledged, as well. It certainly was, Debbie. And I don’t mind mentioning the fact that I pull it off the shelf once in a while — just to take another look. Thanks for stopping by! How superb! That’s certainly an item to cherish. Having a book signed by a favorite author is always a treasure, and this one so much more so since she left such a thoughtful note. What an amazing affirmation of the effort and dedication you’ve put into promoting him! Much appreciated! It certainly is greatly encouraging to read whenever I feel down. How amazing that you have a personalized copy of the book. Yes, I was glad to have a reason to blog about it. Thanks for stopping by! Wow! A cherished possession, indeed, Paul! Nothing greater than an autograph from someone you admire! Thank you for dropping by my place. It was such a pleasant surprise. I would have been happy with just her name, so you can imagine how I felt when I saw it. Thanks! This is a very nice tribute and a most cherished “object”. I can truly feel why it is important to you. And, it is the most personal note you can get from someone regarded, appreciated and respected. A great answer to the Cherished Blogfest! My brother-in-law takes care of the grave of Levon Helm (from “The Band”) in Woodstock, because he has the utmost respect still for the artist. I appreciate such devotion of him and you! Exactly. It felt like I had received an affirmation that I thought I could never get, so it was truly special. That’s a pretty cool factoid about your brother-in-law — I always liked The Band. Thanks for reading and leaving a comment! Thanks! So much more than just paper and ink now. First, I can’t believe that Rod Serling’s been gone for 40 years. Second, I would cherish that book dearly. We lost a voice of such clarity and compassion when he died. That’s part of why I like to help perpetuate his work — so it can keep finding new audiences. Thanks for the comment. Interesting post. Thanks for sharing your cherished object. Thanks! It was a pleasure. That must have been awesome for a true fan. Makes lot of sense why it took the cherished place. It was a pleasure. Hope you enjoy the book!